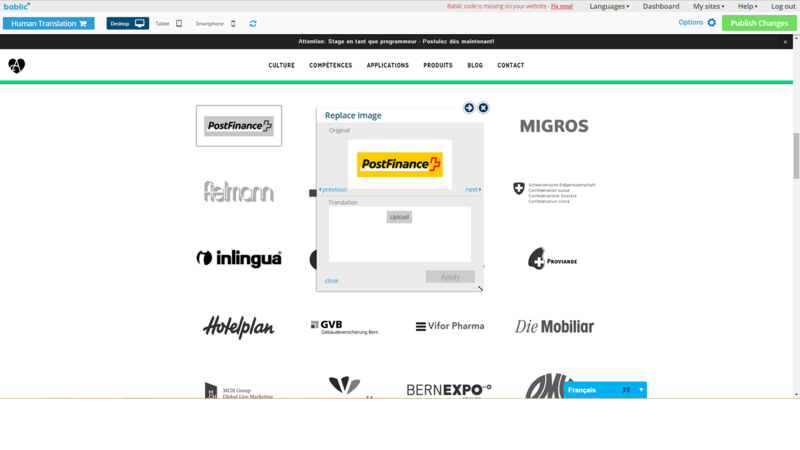 Bablic Translation - Translate your Weebly site in minutes. 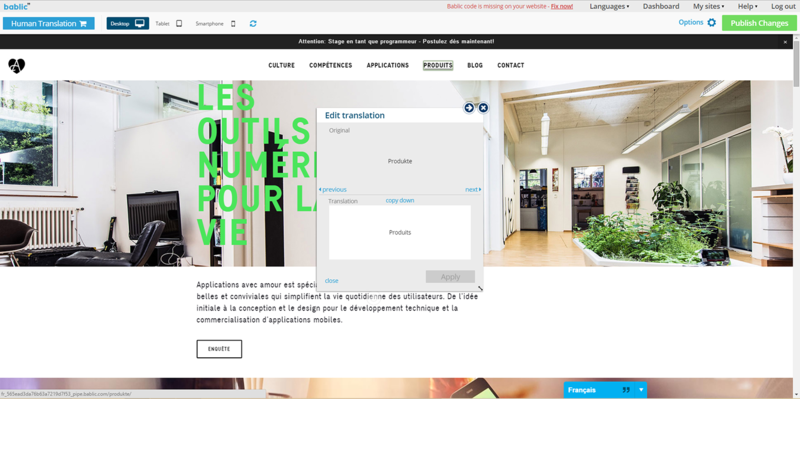 Translate your Weebly site in minutes. 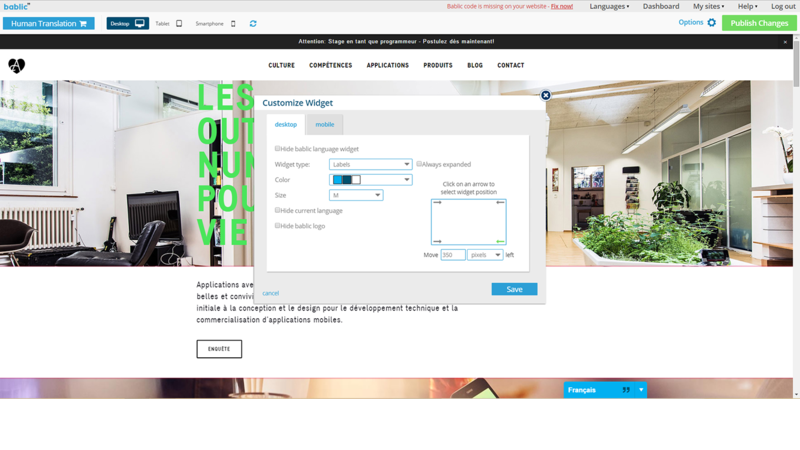 Translate your Weebly site in minutes, no coding required, just use our user-friendly, visual editor. Trusted by hundreds of businesses. Free 1-on-1 consultations. Speak to any one of our dedicated localization experts for advice and more when entering a new market, free of charge. Dedicated support. All inquiries are answered within a matter of hours. Access to human translation. Get high-quality, professional, human translation from Bablic's network of translators, the same one used by industry leaders such as Google, IBM, Expedia and other Fortune 500 companies. Machine translation. Start off with machine translation and then manually improve it in order to save and even skip on ordering professional human translation if possible. Global delivery network. 99.9% uptime pretty much guarantees you won't miss a sale. Collaboration. Invite colleagues to help translate your website, assign them roles with limited access such as Translators, or even Admins with more freedom. Bablic's offer both monthly and annual plans starting at $20/month Basic plan: $20/month (billed annually) Premium plan: $57/month (billed annually) Ultimate plan: $289/month (billed annually) More details on our pricing page. Contact us with any questions or concerns, we'd be happy to help! We tried other translation tools and services. This one has been the best. We like the ability to modify, edit or save our own translation in places where the machine translation is incorrect. This app has saved us lots of time. Great product with a lot of customization ability! Great application - easy to use! Amazing app! I translated my Spanish site into English in a matter of seconds! This app really is good!! It does all that i need . Thanks allot for this incredibly app. Absolutely amazing ! Translation of my whole site was instantaneous and didn't need as much reviewing as I was anticipating. Miraculous product. Very easy to use. Thanks !